The first two weeks of the semester are very busy with new student orientation sessions, course registration, and other activities. It is also time to settle in a new environment at AIU. In consideration of students’ busy schedules, AIU requires all new students to purchase the 21-Meal Plan (three meals a day, every day) during the first two weeks after arrival. After this two-week period, students have several meal options. This 21-Meal Plan for the first two weeks (14,400 JPY) is included in the invoice and must be paid before your arrival. The meal cost after this period (which varies depending on the meal option you select) must be paid after your arrival. *The 10-Meal Plan cost varies based on the number of days covered during the semester. *The Japanese government is currently debating an increase in sales tax to 10%, which will effect the prices above if it comes into effect. *You can also purchase meals one at a time from the Cafeteria in cash. (Breakfast 310 JPY, Lunch 410 JPY, and Dinner 410 JPY). *The meal plan / pre-paid card option is not mandatory for short-term international students, however, please note that rooms in the Komachi Residence Hall do not have kitchens. Students in Komachi Residence Hall may use its communal kitchen for everyday meals. Cooking in residents rooms is prohibited in Komachi Residence Hall. 7:00 a.m. – 8:30 a.m. 11:00 a.m. – 1:30 p.m. 5:00 p.m. – 8:00 p.m.
7:30 a.m. – 9:00 a.m. 11:30 a.m. – 1:30 p.m. 5:30 p.m. – 8:00 p.m. The cafeteria may be able to arrange a meal in case you are unable to have a meal during the opening hours of the cafeteria because of your class schedule. 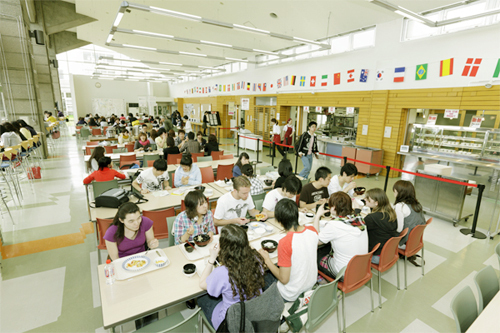 Students with dietary restrictions should contact us at international@aiu.ac.jp. We will try to arrange well-suited menus with the cafeteria staff. The meal plan is not offered during “Golden Week,” (a series of national holidays from late April to early May), during the Summer break (from early August to late August), during the AIU Festival lunch time (mid-October), or during the Winter Break and Winter Program (from late December to late March). However, meals are available in the cafeteria on a cash basis except during the Summer holidays in August (Obon Week: mid August), during the year’s end and during the New Year period (from late December to early January).